Provincial Pullenvale Sophistication on 10.08 Acres. Exceptionally private and exquisitely presented, this beautiful residential estate epitomises sophisticated luxury with every expectation well and truly surpassed. Just 15 kilometres from the CBD in prestigious Pullenvale, this property sprawls across 40,800sqm. Electric front gates open to a private driveway that winds through seemingly endless stretches of green, parklike grounds with a private, two bedroom gatekeeper's cottage. Though at the heart of these expertly manicured grounds is a commanding family manor, beckoning with the promise of comfort without compromise. The custom wrought iron front doors open to an oversized floor plan that encompasses two generously proportioned levels. Formal and casual living and entertaining areas fuse together; every room features its own distinct space yet flows to the next in a flawless expression of unrestricted family living. Stone tiles, exposed timber beams and working fireplaces combine with graceful fixtures, warm tones and natural light to create a provincial sophistication that emphasises a warm and welcoming family ambience. The kitchen demonstrates superior fit and finish with every accoutrement in place for those that delight in culinary adventures. This gourmet space opens to the living and dining area, inviting get-togethers across all scales, and comes complete with Bianco Romano granite benches, Qasair, Miele and Nef appliances, Zip hydra tap and a butler's pantry with a double sink. Banks of bi-folds and French doors open multiple rooms to an extravagant deck that envelopes the rear of the home, promoting a relaxed and balanced lifestyle in which to enjoy uninterrupted indoor/outdoor living throughout the year. A floodlit tennis court and 20 metre swimming pool complete with diving board are perfect for outdoor fun, while a separate, fully contained pool house with a home cinema, 3D projector, sound system and fireplace offers an entertainment mecca for children and adults. The main residence is completed by five large bedrooms, which includes a decadent master suite with its own fireplace, private marble ensuite and separate walk-in robe/dressing room. A home of this calibre wouldn't be complete without a host of outstanding additional surprises, including a stunning two bedroom guest quarters with a newly fitted kitchen and bathroom. 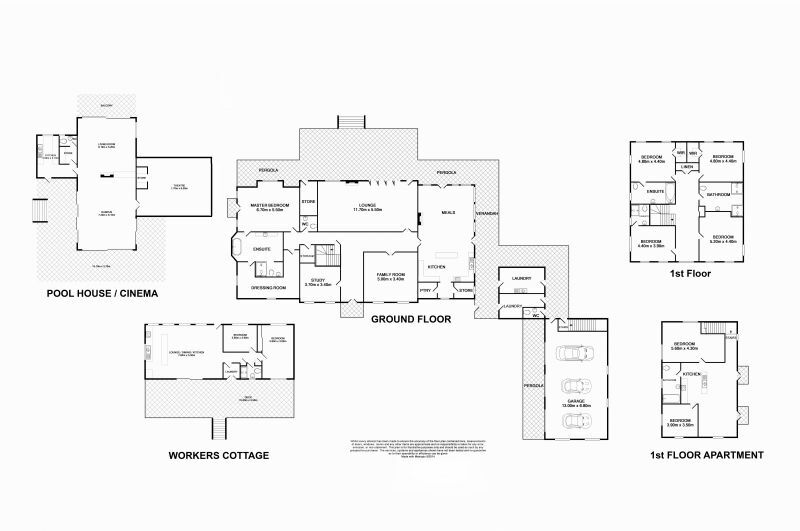 Other features include a library, rumpus/TV room and a comms room. From the ducted air conditioning, security system and Sonos sound system to the horse paddocks, chicken coop and fenced children's play area, this prestigious residence is an all-encompassing estate that will leave you wanting for nothing. Positioned to ensure peace and tranquillity yet maintain the convenience of being close to all amenities, this stunning estate offers the ideal family lifestyle. Schools and transport are easily accessible as is nearby Kenmore Village and very popular Indooroopilly Shopping Centre and local Pony Club. Aside from the lush full fenced 10 acres surrounding the home access to the CBD is just 15 minutes away.